These views are similar to attitudes about U.S. relations with Cuba in July 2015, following the decision to renew diplomatic ties. At that time, 73% approved of the re-establishment of U.S diplomatic relations with Cuba, and 72% favored an end to the trade embargo. 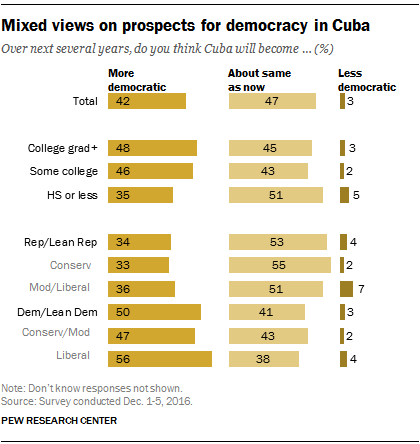 However, Americans remain skeptical about the prospects for increased democracy in Cuba in the coming years. Fewer than half (42%) expect Cuba to become more democratic over the next several years, while 47% say it will be about the same as it is today; 3% expect Cuba to become less democratic. These opinions also have changed little since July of last year. There continue to be partisan differences in views of U.S. policy toward Cuba: Democrats are more likely than Republicans to support diplomatic ties and an end to the U.S. trade embargo. 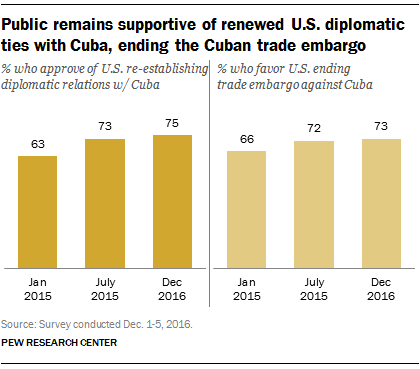 Still, most Republicans and Republican-leaning independents approve of the re-establishment of diplomatic relations with Cuba (62%) and favor ending the U.S. trade embargo (62%). Even larger majorities of Democrats and Democratic leaners back these two policies (87% and 84%, respectively). As with overall opinions about U.S. ties with Cuba, the partisan pattern in these views has changed little since last year. Support for the two policies is somewhat higher among adults younger than 50 than those ages 50 and older. For example, 78% of those ages 18-29 approve of the re-establishment of diplomatic relations with Cuba, and 80% favor ending the U.S. trade embargo. 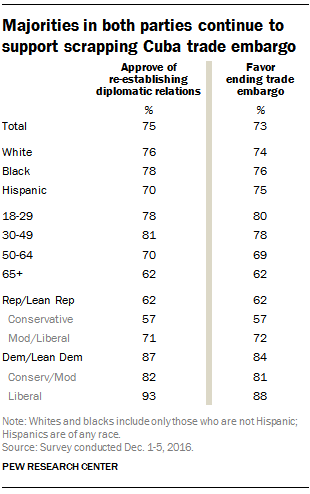 Among those 65 and older, 62% approve of re-establishing diplomatic relations, and the same share favors ending the trade embargo. Among college graduates, 83% approve of re-establishing diplomatic relations with Cuba, and 80% favor ending the U.S. trade embargo. Most of those with lower levels of education also back these two policies, but by somewhat smaller margins. Republicans remain more skeptical than Democrats that Cuba will become more democratic in the next few years. Only about a third of Republicans and Republican leaners (34%) say Cuba will become more democratic; 53% say it will remain about the same as it is today, while 4% say Cuba will become less democratic. By contrast, half of Democrats and Democratic leaners – including 56% of liberal Democrats – say Cuba will become more democratic in the years ahead. Note: Topline for this post can be found here (PDF), and the methodology is here.